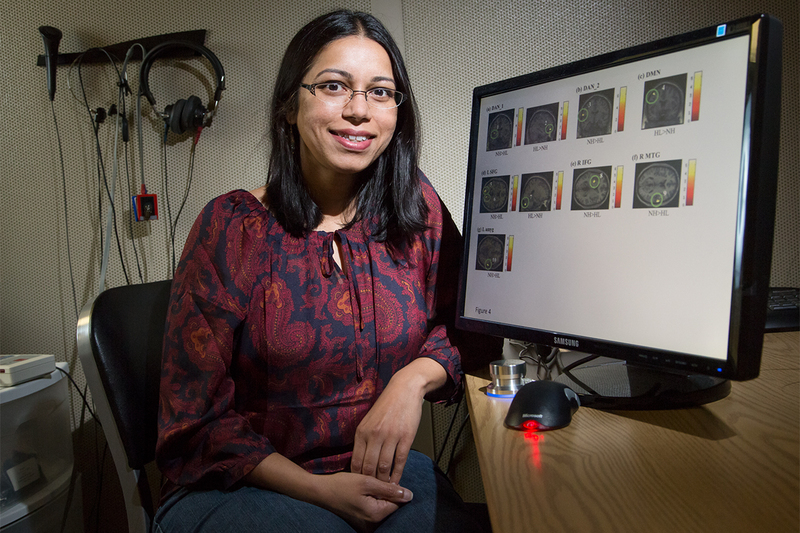 Speech and hearing science professor Fatima Husain and her colleagues found a relationship between tinnitus severity and emotion processing in the brain. CHAMPAIGN, Ill. — Tinnitus, otherwise known as ringing in the ears, affects nearly one-third of adults over age 65. The condition can develop as part of age-related hearing loss or from a traumatic injury. In either case, the resulting persistent noise causes varying amounts of disruption to everyday life. While some tinnitus patients adapt to the condition, many others are forced to limit daily activities as a direct result of their symptoms. A new study reveals that people who are less bothered by their tinnitus use different brain regions when processing emotional information. “We are trying to understand how the brain adapts to having tinnitus for a very long time,” said Fatima Husain, University of Illinois speech and hearing science and neuroscience professor who conducted the research with kinesiology and community health professor Edward McAuley, M.D./Ph.D. student Jake Carpenter-Thompson and graduate student Sara Schmidt. Husain also is affiliated with the Beckman Institute for Advanced Science and Technology. Carpenter-Thompson is lead author on the paper, which is published in the journal PLOS ONE. Husain’s research uses functional magnetic resonance imaging, an imaging tool that enables researchers to see changes in blood oxygen levels in the brain during an activity. Using fMRI, Husain’s team previously compared how the brain processes emotion in patients with mild tinnitus and people without the condition. While in the scanner, study participants listened to and rated pleasant, unpleasant and neutral sounds (e.g. kids giggling, babies crying and people babbling in the background). The researchers reported that, in contrast to those without tinnitus, patients with mild tinnitus showed greater engagement of different areas in the brain when processing emotional sounds. To further understand this altered brain activation, Husain conducted a new fMRI study to see if there were any differences among tinnitus patients. Because some patients adjust to the ringing in the ears while others do not, the severity of the condition can vary greatly. Husain’s team measured the severity of tinnitus, or tinnitus distress, with a series of surveys and questionnaires assessing hearing, attention, emotion and sleep. Patients with lower tinnitus distress used an altered pathway to process emotional information. The path did not rely on the amygdala, commonly believed to play an important role in emotion processing in the brain. Instead, patients who had adapted to their tinnitus symptoms used more of the brain’s frontal lobe, a region critical for attention, planning and impulse control. The researchers suggested that the greater activation of the frontal lobe might be helping to control emotional responses and reduce tinnitus distress. Another aim of Husain’s research was to evaluate possible interventions to help patients reduce tinnitus distress. The study reported that physical activity might influence emotion processing and help to improve quality of life of those bothered by tinnitus. Husain hopes more research will investigate this link. Her future research on the topic will also include active duty service members, a group highly affected by trauma-induced, early-onset tinnitus. To reach Fatima Husain, call 217-333-2230; email husainf@illinois.edu. The paper, “Increased frontal response may underlie decreased tinnitus severity” is available from the News Bureau.